Defeat Proposition 23? There’s an app for that. Laurene Powell Jobs, the wife of Apple founder Steve Jobs, on Tuesday donated $200,000 to the campaign against Prop 23, the California ballot measure that would suspend the state’s global warming law. With less than three weeks to go until Election Day, the enviro-green tech coalition’s fundraising machine continued to outpace the Texas oil companies backing Prop 25. As of Thursday, the No on 23 campaign had collectively raised $17.9 million to the Yes campaign’s $9 million, according to California Secretary of State records. Also on Tuesday, Vinod Khosla, the prominent Silicon Valley green tech investor, dropped $1.04 million into the No campaign coffers while executives from Google, Bloom energy, and other Valley tech and renewable energy firms made high five-figure donations. The Sierra Club, which is headquartered in San Francisco, weighed in Wednesday with its first sizeable contributions, giving a total of $300,000 to various No campaigns. The No forces also received their first utility industry donation, a $25,000 contribution from Sempra Energy, owner of San Diego Gas & Electric. Nike gave $20,958. The Yes campaign has received only two six-figure contributions over the past week, a $150,000 donation from oil refiner CVR Energy of Sugar Land, Texas, on Tuesday, and $500,000 from Marathon Petroleum of Findlay, Ohio, last Friday. But No on 23 spokesperson Steven Maviglio, a longtime Democratic operative in California, takes cold comfort in those low numbers. He told me on Friday that he fully expects the oil industry to put millions of dollars into the campaign in the final weeks leading to Nov. 2. Prop 23 would suspend California’s global warming law, known as AB 32, until the state unemployment rate dropped to 5.5 percent for four consecutive quarters, something that has happened only three times in the past four decades. AB 32 requires California to cut its greenhouse gas emissions to 1990 levels by 2020. At the giant Solar Power International conference in Los Angeles this week, attendees sported No on 23 buttons and the confab’s organizers tried to rally executives to oppose the ballot measure. 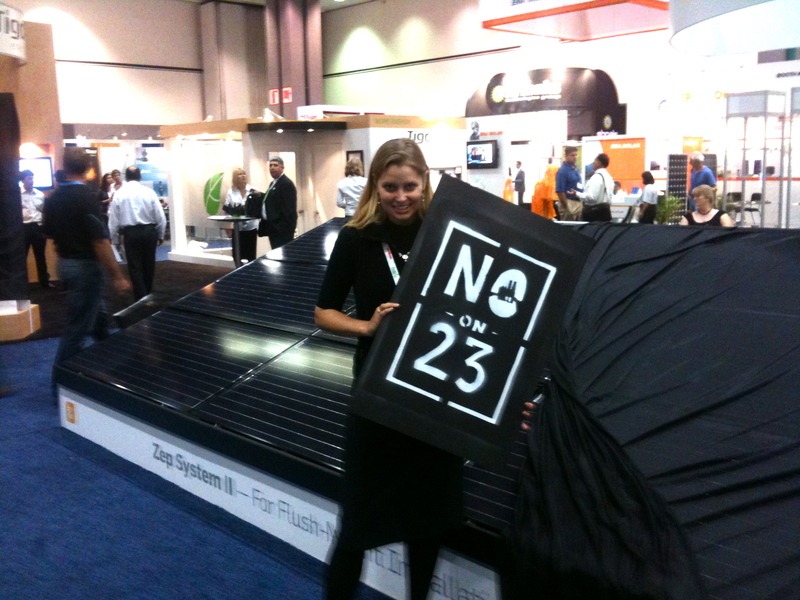 One company, Silicon Valley solar panel installer SunRun, staged a “protest” Wednesday evening against Prop 23 on the floor of the Los Angeles Convention Center, draping booths with anti-23 signs and dispatching employees with picket signs. On Thursday, meanwhile, environmental justice activists were planning to march on a refinery operated by Tesoro, one of the Texas oil companies bankrolling Prop 23, in a low-income Los Angeles community.